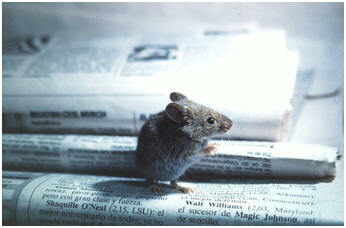 The species Mus musculus have physical characteristics typical of many rodents but they do differ in ways as well. They have a slightly elongated snout, small black eyes that protrude somewhat with large scarcely haired ears. They are a brown to gray color and their belly is of a slightly lighter color. Both males and females have a similar coloration. 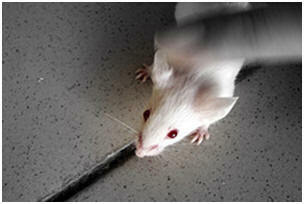 mice are of the species Mus musculus and are highly inbred to select for their albino traits. The species identification is confirmed by viewing three longitudinal rows of tubercles in the crown molars of the upper jaws. This sets them apart from other rodents. The average length of this species is approximately 160 mm from nose to the end of the tail. The tail accounts for almost half of the animal's length and is a hairless, scaly appendage.